Australia's #1 Gateway welcomes the QANTAS Super Jumbo A380 in this program! The world's first Super Jumbo comes to Sydney for the very first time. Witness the first arrival and departure of this mega double-decker airplane! 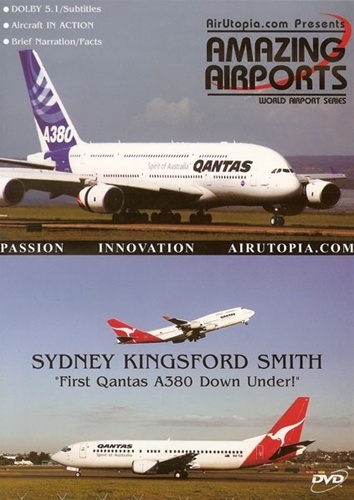 World famous Sydney is home to Qantas, the world's 8th largest airline.....see the entire fleet in action along with rarely seen airliners from the southern hemisphere such as Air Niugini, Air Caledonie, Hawaiian, Air Nauru, Virgin Blue, and beautifully electrifying Air Pacific of Fiji! Come see why Sydney is one of the most photogenic airports in the world!! First Arrival and Takeoff of Airbus' A380 with Qantas Titles! Run time is about 85 minutes. Format is NTSC DVD and Region-Free.